Yu-Gi-Oh! 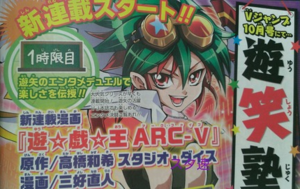 ARC-V is a manga series based off of the Yu-Gi-Oh! ARC-V anime series. It begun serialization on August 20th, 2015, in the V Jump magazine. The manga is being published monthly in Japanese in the V Jump magazine, and in English in the Weekly Shonen Jump magazine. The story is written by Shin Yoshida, the Duels by Masahiro Hikokubo, and it is illustrated by Naohito Miyoshi. Like most of the previous manga spin-offs, the ARC-V manga features a completely different story compared to its anime counterpart. Yuya Sakaki is a mysterious Dueltainer known as "Phantom" who came to Maiami City from two decades in the future to find an all-powerful card known as Genesis Omega Dragon. Being hunted down by the Leo Corporation's CEO Reiji Akaba, who is also from the future, Yuya reluctantly accepts the aid of a resident girl named Yuzu Hiiragi. Yuya is also aided by "alternate personalities" Yuto, Yugo and Yuri, though the three are trying to keep Yuya in the dark about who they really are for his sake. Furthermore, both Yuya and Reiji are being hunted by a third faction that possesses the G.O.D. card and needs them to awaken its full power. The Yu-Gi-Oh! ARC-V chapters are called "Scales", so, instead of "Chapter 1", you should look for "Scale 1", for example. The ultimate objective of the protagonists is to find a card whose name can be shortened to "GOD" and has the power to decide the fate of the world. Awakening "GOD" requires the use of The Adam Factor and The Eve Factor, named after the first humans in the bible who were created so that they may "know God". The main antagonist's name is "Eve", who caused the fall of mankind by disobeying god. "GOD" came from the space between dimensions and thus outside of space and time. This is more a reference to modern Christianity than anything from the Bible, in which God was thought to dwell in the sky and was written during a time when the sky was as unknowable to people of that era as the space beyond our universe is to us.